Place the salmon, yogurt and chives in a food processor and blend until a coarse paste. Place the flour, yeast and salt in a large bowl. Mix the oil with 250ml luke-warm water and stir into the flour to form a dough. Knead the dough on a floured surface for 10 minutes. Place in an oiled bowl, cover with clingfilm and leave for 1 hour or until doubled in size. Knock back the dough and divide into 12. Roll each out into roughly a 15cm circle and rest for 15 minutes. Fry the flatbreads in a frying pan with a little oil, 2 at a time, for 3-4 minutes, turning once. Try adding chopped herbs or toasted sesame seeds to the flatbread dough. 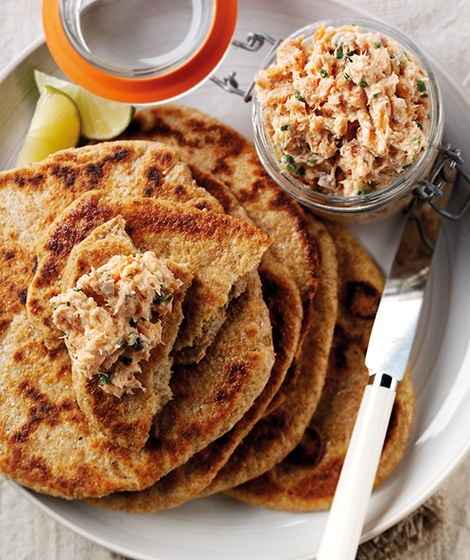 Try using smoked mackerel instead of the salmon for the pate.